Use for squats, throws, cleans, jerks, snatches and rotational swings. 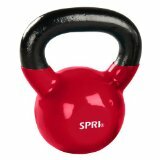 The SPRI Kettlebells have handles designed for comfort and fully vinyl coated iron bells to help protect floors. 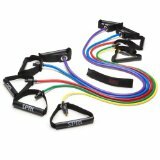 Ideal tool for both personal and group training. Available in 5, 8, 10, 12, 15, 18, 20, 25, 30, 35, 40, 45, 50lbs. NOTE: 30, 35, 40, 45 and 50lbs are sold as SINGLES – ALL other weights are sold as PAIRS: 3, 5, 8, 10, 12, 15, 20, and 25lbs. Deluxe grade, quality engineered and built to last a lifetime. 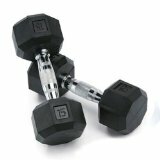 Black rubber-encased 8-sided dumbbells with chrome contoured handles. NOTE: 30, 35, 40, 45 and 50lbs are sold as SINGLES – ALL other weights are sold as PAIRS: 3, 5, 8, 10, 12, 15, 20, and 25lbs. 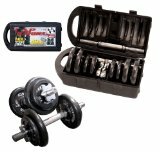 Durable, vinyl coated dumbbells. Color-coded and marked on each end for easy weight identification. 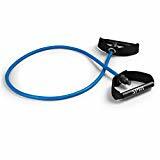 Ideal for aerobics, step training or walking. Sold in pairs only and available in 1, 2, 3, 4, 5, 6, 7, 8, 9, 10, 12, 15, 18, and 20lbs.